Q: Can you give us explanations for why Foreign Minister Wang Yi is now also a State Councilor? Some people are saying this is a sign of the increasing importance that China attaches to its diplomacy. A: The first session of the 13th National People’s Congress has elected new leadership of national institutions, which reflects the shared aspiration of all members of the Party and people of all ethnic groups. In terms of diplomacy, since the 18th CPC National Congress, the Central Committee with Comrade Xi Jinping at its core has bore the larger picture in mind, forged ahead with determination and blazed new trails, guiding China’s diplomacy to open up new horizon. Our diplomacy will always fully follow through on the Xi Jinping Thought on Socialism with Chinese Characteristics for a New Era. 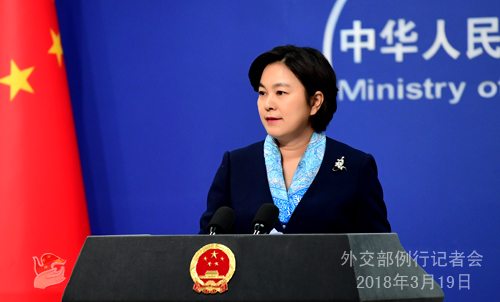 We will ensure the power of diplomacy rests with the CPC Central Committee and continue to strengthen the Party’s centralized and unified leadership and comprehensive planning and coordination of foreign affairs, so that the CPC Central Committee’s major foreign policies and strategies will be effectively implemented. Q: According to the preliminary data, Vladimir Putin has won the presidential election held in Russia yesterday. What’s China’s comment? How do you see the prospects of China-Russia relations? Will Mr. Putin be invited to visit China after he takes office? A: Yesterday, a presidential election was successfully held in Russia. According to the preliminary data of the Russian Central Election Commission (CEC), President Vladimir Putin has won the presidential election and been reelected. President Xi Jinping has sent a congratulatory message to him. China and Russia are good neighbors and comprehensive strategic partners. In recent years, under the strategic guidance of the two heads of state, the China-Russia comprehensive strategic partnership of coordination has kept operating at a high level and is now at its historical best. The strategic mutual trust between the two sides have been continuously strengthened and fruitful outcomes achieved in cooperation in various fields. Both China and Russia are now at a crucial stage of their national development respectively. After it was announced that the first session of the 13th National People’s Congress unanimously elected President Xi Jinping as Chinese president on March 17, President Vladimir Putin warmly congratulated him by sending a telegram of congratulations immediately. China has also sincerely congratulated Russia on the smooth completion of its important national political agenda and will support Russia in following a development path that suits its national conditions as always. We believe that under the leadership of President Putin, Russia will maintain steady development and play a greater role in international affairs. We are deeply convinced that under the strategic guidance of President Xi Jinping and President Vladimir Putin, the Russia-China comprehensive strategic partnership of coordination will embrace new opportunities and achieve new outcomes, which will make greater contributions to promoting common development and prosperity of China and Russia and the regional peace and stability at large. Following the practice of exchange of visits between the two heads of state annually, the Russian president will pay a state visit to China this year. The two sides will maintain close communication through diplomatic channels regarding this matter. Q: At the International Institute of Finance forum in Buenos Aires, Argentina, US Treasury Undersecretary David Malpass said an increasing amount of state control over China's economy and its moving away from markets were worrisome to the world. What’s your comment on this? A: China’s socialist market economy has made huge achievements. This is an undeniable conclusion that any unbiased person will surely arrive at and that will not be changed by any random criticism or irresponsible remarks by certain US official. Reform and opening-up is China’s fundamental state policy. This year marks the 40th anniversary of China’s reform and opening up. Over the past four decades, China’s rapid development has substantially improved the living standard and life quality of Chinese people and made indispensable contributions to global economic growth and poverty alleviation. China has contributed to over 70% of global poverty alleviation and 30% of global economic growth, an obvious fact for all to see. As we said, China’s reform and opening up will keep going on without an end. In light of the 40th anniversary of reform and opening up, the Chinese government will roll out stronger new measures to deepen reform and opening up. Now as the global economy still faces great uncertainties and risks, we believe all countries should closely cooperate in solidarity rather than point fingers at each other. As a responsible major country, China stands ready to work with various parties to press ahead with structural reform in a coordinated way to promote the strong, sustainable, balanced and inclusive growth of world economy. Q: The US has decided to take restrictive measures against imported steel and aluminum products. According to the Wall Street Journal, White House trade adviser Peter Navarro once sought funding of 1 million US dollars from a US steel company for a documentary film “Death by China” which contributed the demise of the US steel industry to China. Some commentators say that Navarro got financing from interest group to fund a film that advances his own political stances. The FBI is now looking into this case. How do you view this? A: I have seen relevant reports. I don’t want to comment on their contents, nor am I in a right position to do so. 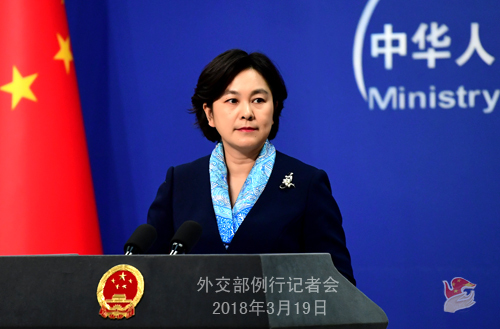 Regarding the restrictive measures taken by the US side on imported steel and aluminum products, the Spokesperson of the Ministry of Commerce and my colleagues have made clear China’s position many times. I want to point out that under the current circumstance, “beggar-thy-neighbor” and “indiscriminate shelling” are by no means helpful and effective ways to solve problems, nor are they constructive. We hope that all parties could calm down and talk to each other, follow the rules of the WTO and the market economy, and resolve the issue through cooperation so as to jointly maintain the order of international trade. That is the best way to serve the common interests of all relevant parties as well as the international community. Q: Foreign Minister Wang Yi was elevated to the position of State Councilor today. Can we presume that he will now be the Special Representative for India-China border talks? A: The Special Representatives’ Meeting on the China-India Border Issue is a high-level channel for border negotiations as well as an important platform for strategic communications between the two countries. China attaches great importance to this mechanism and would like to make full use of this important mechanism to keep in close strategic communications with the Indian side so as to enhance strategic mutual trust and maintain the sound and steady development of China-India ties. Q: According to a report released by the World Intellectual Property Organization (WIPO), China received the largest number of patent applications in 2016, exceeding for the first time the combined total of the US, the EU, Japan and the ROK. Meanwhile, we note that some countries and relevant people cannot stop taking up the issue of intellectual property rights protection with China. What is your comment? A: According to the WIPO’s annual World Intellectual Property Indicators report released in December 2017, China’s State Intellectual Property Office (SIPO) received the highest number of patent applications in 2016, a record total of 1.3 million, exceeding the combined total of the US, the EU, Japan and the ROK. Among them, 90% were filed in China and 10% abroad. Besides, China become the first country worldwide with more than 1 million patent filings in 2015, and by 2016, the number of China’s effective patent holdings surpassed for the first time 1 million, making China the 3rd country to join the million club after the US and Japan. All these show that China has already become a major IPR country. As WIPO Director General Francis Gurry said China’s share of patent applications worldwide shows the innovation trend in China, and China is increasingly amongst the leaders in global innovation and branding. China is taking solid steps to implement its innovation-driven strategy for development. We hope that China’s efforts and achievements in this field could be recognized in an objective and fair way. After the conclusion of the first session of the 13th National People's Congress (NPC) on the morning of March 20 (Tuesday), Premier Li Keqiang will meet with and take questions from Chinese and foreign press at the Golden Hall on the third floor of the Great Hall of the People. The regular press conference of the Ministry of Foreign Affairs will be adjourned on March 20 and resumed on March 21 (Wednesday). We remain open to your questions through telephone, fax, WeChat or email.